Wager Yuval, President and Founder Access Israel Org. Awareness is crucial for any organization in order to successfully promote it's missions. There are several "Accessibility Awareness Days" in the calender today, "International Day of Persons with Disabilities" every 3rd of Dec, "Disability Month" every October, "GAAD – Global Accessibility Awareness Day" on May 19, the "Accessible Tourism" and more. 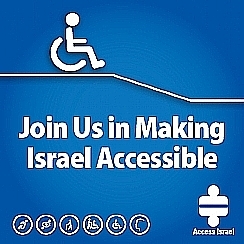 As an NGO, Access Israel is promoting awareness all year long with zero costs focusing on various issues, for example: every summer - public beach & pools accessibility; every September when school begins - schools accessibility and inclusive education, on major holiday vacations - accessible tourism & cultural events, once a year we have an an awareness day focusing on saving designated parking for people with disabilities. From our experience a change of awareness is a long term process. We are using all of the free media available: TV ads, newspapers articles and free ads, radio items, articles and ads for news websites, Facebook posts and free campaigns, mailings to newsletter subscribers and Instagram pictures. As an NGO we enjoy helpful free advice from media professionals on promoting affective awareness campaigns and utilizing free media. In order to invoke interest in the media, you need to point out bad practices coupled with interesting personal human stories. Another means to get through to the public, is to publish quantitative information derived from reliable surveys. Even though we understand the media’s interest in problems and bad practices we still make continuous efforts to interest the press with positive stories. It's a challenging task. Once every four years, we have the Paralympic Games which is a great opportunity to conjure International and local awareness. Most NGOs don’t have the resources to hire a designated worker to promote awareness and usually have no budget for media campaigns, however, an NGO can still negotiate much more value- for- money awareness raising platforms and tools than most “for profit” business. It's at has proven to be impossible to convince foundations and donors to contribute and fund awareness campaigns and it is important for the organization to understand why. We at Access Israel believe however, that awareness is a crucial tool for making a difference. We do everything we can to find the funding (even indirectly) and to find the right partners and strong ideas, reinventing ourselves in some cases, for the next successful campaign. There is no doubt that the donor who will see the importance and the effectiveness of this important tool – will be able to leverage the donation and get better value for the money by being a partner to really changing the awareness of the Israeli public.